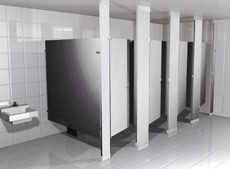 Bathroom partition designs mainly consist of three areas and options: material, mounting style, and layout. 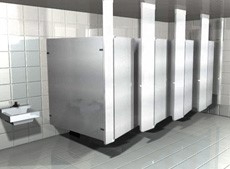 Most commercial bathroom plans are driven by the type of facility and the usage of the bathroom itself. Each restroom is a little different and has its own unique layout. If you have a high traffic bathroom you might want to use a material that would last for thirty plus years. In this case, solid plastic and solid phenolic work well for high traffic and moisture areas. Powder coated steel and plastic laminate are mainly used in less traffic areas and in most cases can also last up to thirty years in buildings such as churches, office buildings, and facilities. For high schools we recommend solid plastic or solid phenolic, as these products cannot bend, break, or even rust. This is a very hard plastic material that will last for years. 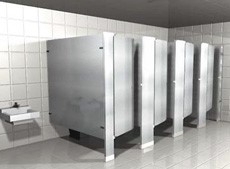 Stainless steel partitions are typically found in high end restaurants and airports, because this product is very easily maintained by maintenance crews. Standard size panels and doors are 58” tall and are mounted 12” off the floor. These sizes are stock in most factories. No sight toilet partitions are a 3-4 week lead time. 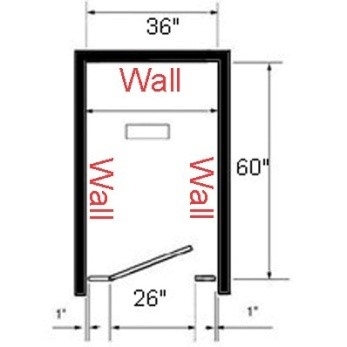 The panels and doors can be at a maximum height of 72”, the minimum floor distance is 6”. The overall height is 78” and is used with all mounting styles. This was created so you cannot see into the toilet stall or out. 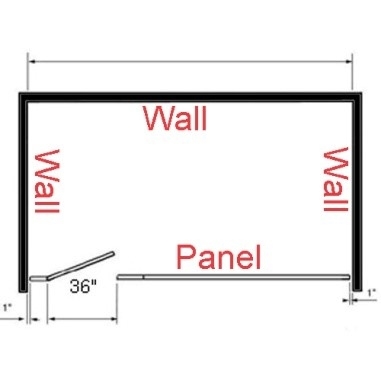 Full length channels are used with the panels and pilaster to create a block between the wall and the partition. The doors on either side have a continuous door stop and a piano hinge typically. These systems are becoming more popular these days. Over head braced floor mounted is the most common. This type the pilaster mounts to the floor and is braced at the top with an aluminum head rail at 82” ht. This is one of the most stabile systems for toilet partitions. This type is a quick ship with some factories and is delivered in as little as 3 business days. Floor mounted only is mounted at the floor with no support at the top, which makes this mounting style very shaky, we do not recommend if there is 3 or more toilet compartments. 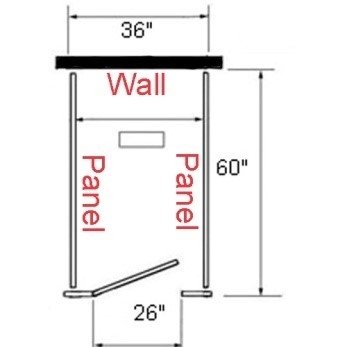 The overall height is 70” and works great for low ceilings under 84”. The style is not a stock item and is usually 3-4 weeks in production with all manufactures. Ceiling hung toilet partitions are braced by your ceiling and do not touch the floor. This is great for easy maintenance taking care of the floors with the partitions 12” off the floor. This product is also a lead time of 3-4 weeks. Floor to ceiling braced is great for extra support for high traffic. This mounts to your floor and ceiling for that extra stability. For most manufactures the maximum height is 120”. If ceilings are taller this might not be a good candidate. This style is a 3-4 week lead time. This type always starts out from either wall on the right or left side. This type has critical measurements between walls. Free standing stalls with panels on each side. Ada Alcove stalls always have a 36” Ada door off to one side. 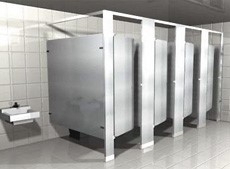 The manufacture and toilet partition design will determine your lead time. Most partitions take 48 hours to 3 weeks to ship from the manufacturer. One week delivery is typically for over head braced systems. 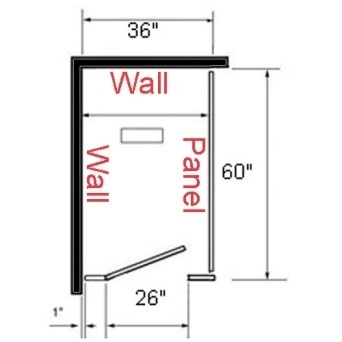 Let us help you determine the best bathroom partition design for your usage. Visit the partition quotes information page and submit an inquiry.